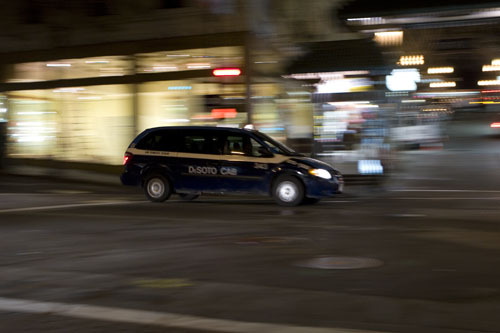 SF Taxi Media: Bad Time Peak Time Permits. By Jane Bolig. Jane Bolig is president of De Soto Cab. San Francisco is unique. Even our taxi laws are unique. In other cities companies can own medallions. Here, even the suggestion of company medallions is heresy. You might as well ask a Baptist preacher to kiss the pope’s ring. You don’t do it. Yet, because of our unique, driver-medallion-only law, all the cabs are out all the time; sometimes there are too many, sometimes too few. With no ability to respond to wildly up-and-down customer demand, we have both a peak time problem AND a down time problem. To address, if not fix it, we are discussing just one part of the problem: peak times. So, let’s forget the obvious solution for both peak and down times: company medallions. It will upset too many people, so just forget it. Let’s think realistically. Realistically, SFMTA won’t consider any solution that doesn’t make money…for itself. Perhaps that is why SFMTA has proposed—to itself—a solution that makes money for SFMTA and gives it control without apparent responsibility: franchise peak time medallions. The city would rent peak time medallions to “qualifying” companies for three years or so. If the company was a good company, if it spoke only when spoken to, chewed with its mouth closed, happily complied with SFMTA’s every regulatory whim, maybe—maybe—its leases would be renewed for another three years. Meanwhile, SFMTA would have money to plug its deficits, paint more bicycle lanes, hire enforcers to ticket drivers when passengers exit onto bike lanes, and—oh, so much more! If you think SFMTA should not just regulate but dominate the cab industry; if you love the idea of pouring money into an organization that takes more and more and gives less and less, you must love franchise medallions. If you are SFMTA, and imagine that you can dig your fingers ever more deeply into the cab industry pie without getting your fingers burned, you’re delighted. Wait a minute, “burned,” how could MTA get burned? First, think, “permits, not medallions.” That’s what Chris Hayashi keeps telling us: franchise peak time permits would be owned by the city, so they would be permits, not medallions. Next, consider this possibility: One of the franchise peak time permit cabs plows into a school bus. Whom do the parents sue, the cab company? Certainly. What about the owner of the franchise peak time permit? That’s you, SFMTA. Think the parents will come after you, too? You betcha’! Oh, but it does. Cabs on the whole have much better driving records than other cars, but cabs are on the street more often, and eventually one of them has a catastrophic accident. It’s horrible and tragic, and we all try to prevent it, but, sadly, it happens. “Not to SFMTA! Our regulations will be so effective that there’s NEVER a big accident.” Yeah, right. Just like with your busses. There will be accidents, both big and little. And you, SFMTA, with your deep pockets, must be prepared to dig deep when litigants come calling. There may be a lot of money to be made from leasing franchise peak time permits. But there’s a lot of risk, too. SFMTA doesn’t need the risk and our industry doesn’t need franchise permits. There are better ideas that can benefit our passengers and our industry AND make money for SFMTA. Maybe SFMTA will self insure like they do with buses. They seem to drop a few million a year on that. More likely they will get a hold harmless- indemnification agreement with YCC and Luxox. I'm sure all these meds. will end up there. Of course they should pay the MTA the equivalent of $2300 a month so they don't get an unfair advantage on the rest of us. Paul Gillespie said he would quit driving if a peak time cabs hit the road. What about the thought of carrying uninsured motorist in case of a bad accident. Oh forgive me its too expensive for the taxi company. Instead lets give them Workman's Compensation and have the driver not covered by the insurance of the cab company after all they are only paying on average 100 per shift, working five days a week 500 a week, four weeks out of the month the driver pays 2000.00. The taxi company can not afford uninsured motorist, nor insuring the driver behind the wheel? Where does that money go? I would like to know the break down. I almost forgot then there is another driver who drives that's 4,000 a month. Great scam we got going here in San Francisco, such a great progressive city. Isn't about time the city helps out these poor drivers who have no health care, now no insurance coverage behind the wheel, and including no uninsured motorist coverage. Did I mention possibly no air bags, because the taxi company is not required to replace the air bag once a car is in an accident according to the city of San Francisco. I thought this was a federal law that air bags must be in cars 1995 or newer. What if a poor sole gets into an accident and the air bag does not come out because its not there? And there is no insurance to cover the driver and no uninsured motorist? The taxi company will tell you there is Workman's compensation for the driver. One company I know in San Francisco has the drivers sign that they are not covered by Workman's Compensation. Then what? The driver who is paying 2000 a month has to get their own insurance coverage? Where? No one will insure them if they are driving a cab. Oh I get it. They might have personal automobile insurance that will cover while they are driving a cab. Oh my god, personal coverage will not cover the driver while operating a commercial vehicle.... What does the driver do? I guess off the 150 dollars a day that they the driver takes home he or she could pay for their medical bills over the next 30 years. Come on everybody, you waste time talking about these other issues as a diversion. Take care of the drivers who are committed in serving the community and create a safety net for them in case of a bad accident. After some research I have found that only the city of San Francisco considers gates and gas drivers as independent contractors, but the state and federal government consider them employees. The taxi companies, and city is walking away with millions while the poor people who drive are getting hurt and god forbid dying serving the city of San Francisco. Be progressive and help out the working people like you tell the rest of the world San Francisco is suppose to be. Jane you are absolutely correct in your comment that the SFMTA will not be helping the cab industry. I think the only reason the SFMTA has been placed to oversee the taxi industry because the city needs money and so does the MUNI operations. I don't understand how taxi drivers don't get this. We have taxi companies in San Francisco that don't even carry car insurance that covers the driver behind the wheel while they are driving for them. In addition no uninsured motorist coverage. Yet the drivers are paying about 2000.00 a month for a five day week based on four weeks at 100.00 a day for gates. Where does this money go? The car is shared by another driver which would make it 4000.00 the the other two days another 400.00 for a total of 4400.00 a month in revenues off of one car. Yet the city has nothing to protect or has created a safety net for taxi drivers, they jumped in when hotel workers years ago were going to lose their benefits. Why is the city so angry and upset with cab drivers. Maybe there should be a requirement for working in the taxi division at SFMTA that they have five years experience as a full time driver in the taxi industry. I think this is a great idea because the perspective would be different on how to assist drivers in the industry. The SFMTA is now taking money away from the drivers through taxi medallion sales, but what are the drivers getting? What I mentioned above no health care, no retirement, no auto insurance, no uninsured motorist coverage, no workman’s compensation coverage, no unemployment insurance coverage. Can someone tell me why the system is set up this way? It appears as though someone does not like taxi drivers very much. In addition, if peak time medallions are created why not have a rate increase for passengers to cover losses of the cab drivers. Is it really because the city could not afford this through para transit? I like others speak to my customers in the cab and do not see a problem that is large enough to state we need peak time medallions. Customers can wait ten to fifteen minutes on a Friday or Saturday. Why are the cab drivers being held responsible for improper hailing and calling for a cab. The general population needs to know how to access a cab that might be the real issue at hand.